Sure, spring and summer are the seasonal stars for bushels-full of delicious and nutritious fruits and colorful vegetables, but the fall and winter seasons also offers a wonderful variety of in-season fruits and vegetables that offer incredible taste and wonderful health benefits, including root vegetables. Root vegetables are underground plant parts used as vegetables. 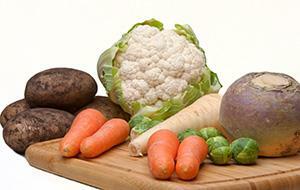 Some common root vegetables are beet, carrot, leek, parsnip, potato, sweet potato, and turnip. Beets are an excellent source of folate and a very good source of fiber, manganese, potassium and vitamin C; carrots are an excellent source of vitamin A and a very good source of fiber, potassium, vitamins C and K; leeks are an excellent source of vitamins A and K and a very good source of folate, iron, manganese and vitamins B6 and C; and sweet potatoes are an excellent source of vitamin A and a very good source of manganese and vitamin C. Do you see a pattern here? Root vegetables are a great source of nutrients! If you want to eat healthier during the winter months and enjoy the most flavor and nutrition from your foods, you’ll want to reach for root vegetables. Serve up maple glazed carrots, parsnip and potato puree, or roasted beets with feta. Once you start eating in season root vegetables, you’re taste buds will appreciate how flavorful they truly are, and you’re body will reap the nutritional benefits.